Again in 2015 I will be completing the Prudential RideLondon , but this time for Teenage Cancer Trust. This is a fantastic charity and I hope to be able to do all I can to help teenagers and young people, and their families who are dealing with cancer. As I work with teenagers on a daily basis and I get to see first hand how great they can be at a wide range of problems and solutions it feels right to be helping such a great charity. You can help me and them from my fundrasing link here. So with a centry planned for early August (this year lets hope the rain keeps away so the organisers dont have to cut short the route) I decided to get an early season sportive into my legs and assess the results. I originally signed up for the full 101 mile route but I am glad I opted for the slightly less 73 mile route insted. If it was later in the seson or the preperation had been better then the 101 would be on. Also I had the option of rideing with a collegeue from work and as we experienced head and cross winds for most of the ride I was glad I opted for the middle distance. It was a nice warm day and ill take the ave moving time 4.42.46 for the 73 miles. before I reflect on this I need to remind myself, as well as inform the reader, that May is near the start of the long training rides for August. Yes I am cycling in club rides and the commute to work, but these are not the long rides to help with thr endurance, although they will help. Overall it was a good test of where I am at fitness wise etc. I would change or rediscover the feeding whilst in the ride. The energy sources from high five is great and I dropped a few zero tabs in for good measure due to the heat, but I think I would pop a few more in my pockets for the refill at feed stations. I also need to get used to when I need to take a gel and how often, something I will have to practice on club rides. I also would benefit from being able to switch off the wind, as this was a nightmare as it normally is but as I can’t I need to go back to the article about how to ride well in the wind. Saying that is was difficult when there was just the two of us. I do much prefer cycling in a group as it works together, but this is a luxury reserved for club rides. Apart from these few changes I feel ok for 118.2km without the ideal about of winter and pre season training. Now to get my gear ready for the commute in the morning. 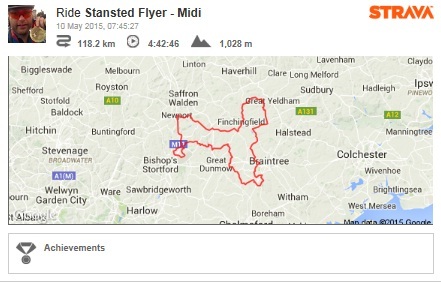 This entry was posted in Club rides, Cycling, Fundraising, Teenage Cancer Trust, Training. I am sure I have blogged before (last summer) about my intentions to join the local cycle club, well there was a lot of procrastination and it never happened, which actually meant that after Ride London last august my cycling took a back seat. Over the winter months the weight went on, the new year came and I decided I would attempt Ride London in 2015! Not a problem, except I was a lot heaver than I was the previous year when I signed up. There was clearly work to be done and the winter training in the gym wasn’t going to cut the mustered. Action plan 1 – The Turbo Trainer! January sales and managed to pick up a lovely turbo trainer for the winter months. At last I was back on my bike, rather than the exercise bike in the gym. I could start to measure cadence and HR again and this made me feel better. I knew however I need to get back out on the road and motivation was a little lacking as the weather was not helpful to start the morning commute. At least I know I have this option for the late autumn evenings and I can still get a workout from my bike. It might have taken until late February to print and post the form and cheque but on 1st March 2015 I received an email confirming my membership, complete with my membership number and the benefits I am now covered by as a club member. Along with this I was now on the email list to receive weekly ride details. Just get up early on a Sunday morning and see what it is all about. Remember don’t make a fool of yourself and try and fit in. Well the first club ride came and I was welcomed into the club. In the following months I have starting to make new friends and meet people, as well as gain some very useful tips and guidance to improve my cycling. Some of these have had the desired effect already (higher cadence and higher seat post) and I have managed to step up a group. I have been made to feel so welcome when the request for ride leaders and ride assistants came, I felt I could not help out. Another part of my cycling education keeping others safe and regulating the pace in the front of a group etc, but all good fun. So if you are thinking of joining a cycling club, then my advice is go for it. They are all different so you will need to complete some research first, but if your local club is anything like mine then it will be a pleasure when the alarm goes off very early on a Sunday morning. Happy cycling and keep safe out there. This entry was posted in Club rides, Cycling.